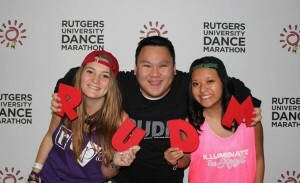 Rutgers University Dance Marathon (RUDM) is the largest student-run philanthropy in the state of New Jersey. We could not make this claim without the support and involvement of the dedicated students. Since 1999, countless Rutgers students have shared their enthusiasm, compassion, spirit and passion for this important cause. There is a place at Dance Marathon for everyone. Read through the involvement opportunities and discover the many ways that you can make a difference. To us, everything counts. So whether you dedicate a year, a semester, a few months or a weekend, you will have made a tremendous contribution. The easiest and best way to participate in RUDM is to dance! Dancers pledge to stand on their feet during Dance Marathon weekend and raise $350 for Embrace Kids Foundation. Click here to learn more about being a dancer! Captains help plan the marathon throughout the year and serve on one of six different teams. Click here to learn more about being a captain! Volunteers help out during Dance Marathon weekend for 5-hour shifts to help the marathon run smoothly, and raise $150 for Embrace Kids Foundation. Learn more about being a volunteer! Registered student organizations apply to be part of the RU4Kids Program in the beginning of the fall semester. This program pairs registered student organizations with Embrace Kids Foundation patient families, who then spend the year getting to know one another by attending Embrace Kids and Dance Marathon events and during visits to the hospital or clinic. Email ru4kids@marathon.rutgers.edu to learn more. Rutgers University Dance Marathon Alumni are tremendously generous and loyal members of the DM family. Throughout the year, RUDMA holds events to raise money for RUDM and to get together and reminisce. Join the alumni Facebook group to connect and learn more about events.